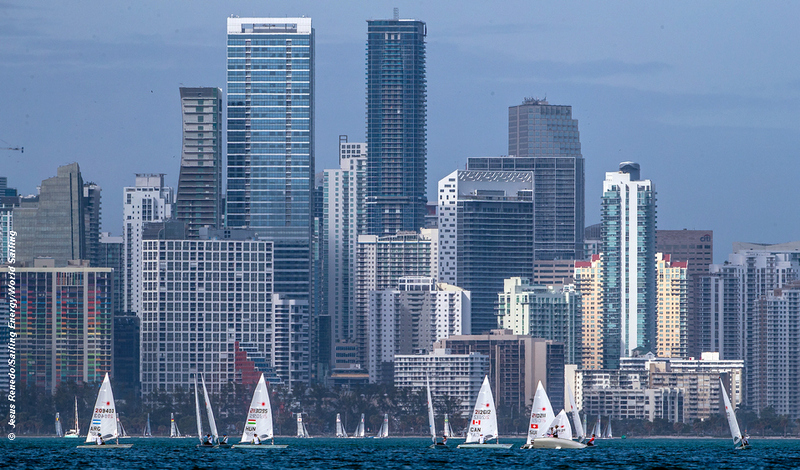 The Hempel World Cup Miami opens for business on Sunday 27 January and the British Sailing Team (BST) will be there in strength for the first major of a very important season. Selection for August’s Enoshima Olympic test event is the immediate goal, and that decision is made by an expert panel, the Olympic Steering Group, made up of former Olympians and BST senior management, by 15 June 2019. Performance at the Enoshima test event would then likely determine whether an athlete is recommended for Team GB (Olympic) selection or whether the selection process continues. The Olympic entry deadline is 6 July 2020. Luke Patience and Chris Grub return for the men’s 470 event in which they scored a big win last year, and Hannah Mills and Eilidh McIntyre for the women’s event. Mills and McIntyre will want to improve last year’s performance when they were beaten by Amy Seabright and Anna Carpenter, who just missed the podium by a point. Japan’s Ai Kondo Yoshida and Miho Yoshioka are likely to be the team to beat here. No Aussie 470 teams this year, and winners of the men’s warm-up event were Panagiotis Manti and Pavlos Kagialis of Greece, but home team Stuart Mcnay and David Hughes could be someone to watch for. In the women the Dutch pair Afrodite Zegers and Anneloes van Veen will be looking to build on last year. The Laser with over 100 entries, includes eight from Britain led by Nick Thompson, with Elliot Hanson, Mike Beckett and Lorenzo Brando Chiavarini vying for top spot, where Matthew Wearn AUS, Sam Meech NZL and Philipp Buhl GER should feature. The Radial event was won by Alison Young in 2018 and she will be looking for a repeat to kick-start her attempt to represent Britain for a third Games. Georgina Povall and Hannah Snellgrove will be hoping to rack-up the pressure at the start of the Tokyo selection process. Podium favourites include Marit Bouwmeester of Holland plus Emma Plasschaert BEL and Paige Railey USA. The 49er should see last year’s winners Dylan Fletcher and Stuart Bithell going for gold again, with the #2 pair, James Peters and Fynn Sterritt looking to carry their Enoshima momentum into the new season. Spain’s Diego Botin and Iago Marra took a convincing win in the pre-event, and Sime and Miho Fantela CRO are back. In the 49erFX the British #1 Charlotte Dobson and Saskia Tidy were well beaten here last year by Sophie Weguelin and Sophie Ainsworth, but hit back at Enoshima last September. This year both the top Brazilian and New Zealand 49erFX teams are competing as Tokyo 2020 begins to bite, to add to the challenge. The RS:X men will have seven Brits competing. Since the retirement of triple Olympic medalist Nick Dempsey, no one has made his spot their own. Kieran Martin-Holmes and Tom Squires are the front choices, and Squires had a good pre-event result. The top Dutch sailors, Dorian Van Rijsselberghe and Kiran Badloe have skipped this one, but the French and Spanish are in strength, including 2018 winner Louis Giard FRA who won the pre-event. In the women’s RS:X Bryony Shaw will be defending her British #1 position from Emma Wilson and Saskia Sills, while demonstrating her return to top flight competition is on track. Fourth in Enoshima 2018, Shaw will once again face the top Chinese and Dutch, and last year’s winner here, Hélène Noesmoen of France who edged the pre-event. The Nacra 17 is another top class field with Australia’s Jason Waterhouse and Lisa Darmanin defending their title and Rio gold medalist Santiago Lange and Cecilia Carranza Saroli (ARG) also competing. The British Sailing Team is missing the top pair, Ben Saxton and Nikki Boniface, with John Gimson and Anna Burnet the only British entry. Buoyed up by their fourth place in Enoshima, and having just taken the pre-event in Miami this week, Gimson and Burnet will go into the World Cup on a high. They placed fourth in Miami last year. Note that the first races are on Tuesday 29 January. Medal races take place 3 and 4 February. For something closer to home the Nacra 17, 49er, 49erFX European Championships will be held at WPNSA UK from 11 to 19 May 2019.